Self regulation – Practice non harming of one self by not forcing the body into poses that increase ones pain and speaking kindly to one self. Self care tool Leaving each class with at least one self care tool to help improve quality of life. 1:1, small group, large group in Waterloo Region. Learn effective ways to gently loosen up your stiff body, bad back and decrease pain. Try techniques to spare your spine of unnecessary strain and how to strengthen it gently and safely. We bring yoga and/or dance to you at your location for one person or as many as you like. 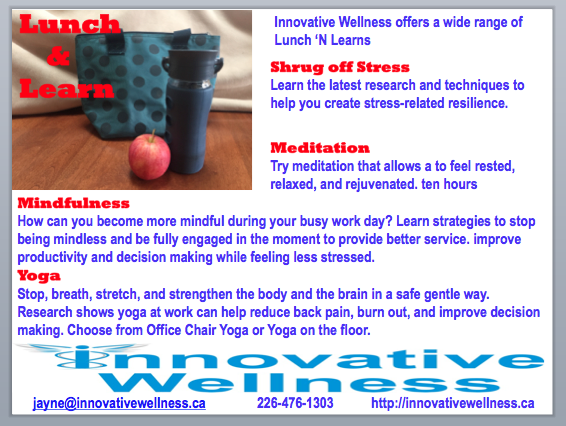 E-mail jayne@innovativewellness.ca to book your seat. If your child(ren) do not want to attend…no problem. We welcome parents without their kids too. 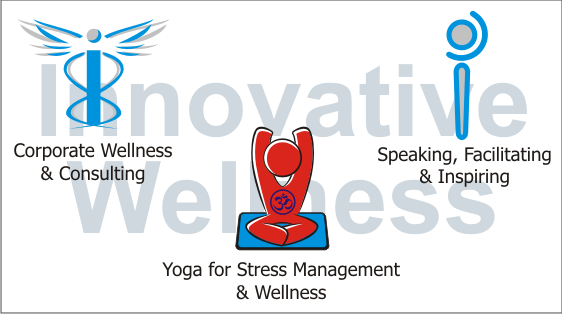 Specializes in trauma informed therapeutic yoga for mental and physical wellness. Jayne has completed over 700 hours of yoga teacher training, taught over 17,000 classes, plus practiced yoga for over three decades. 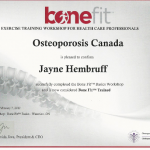 In addition, she has completed the Osteoporosis Canada BoneFit training for fitness professionals, Mental Health Commission of Canada’s Mental Health First Aid, Canadian Mental Health Association’s SafeTALK training, Victoria Order of Nurses Gentle Exercise training, plus more. 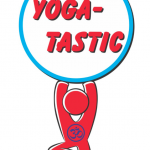 Trained in yoga for all ages and abilities including yoga for trauma, anxiety, depression, mood disorders, concussions, Cardiac Rehab, MS, Parkinson’s, Back Care, Chair Yoga, Pre-Natal, Yoga with Baby, and Family Yoga. We offer private and group classes at our cozy home studio in Waterloo, out in the community throughout KW, as well as we take yoga to your home, workplace, team, groups, etc.If our group classes do not fit your schedule, no problem, just contact Jayne to request another day, time and location. 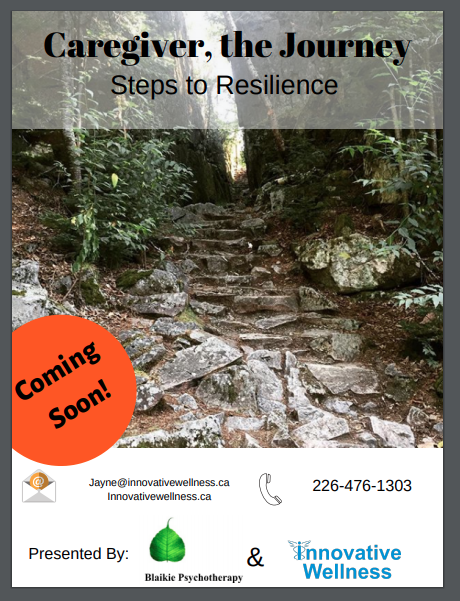 Email jayne@innovativewellness.ca to learn more. If our group classes do not fit your schedule, no problem, just contact Jayne to request another day, time and location. All yoga classes are taught through a therapeutic lens with a focus on creating self awareness, self care and self regulation (not harming self physically or mentally). This is a very slow moving class and allows your body to be fully supported by props like pillows. It is the most gentle style that moves very that will never create a sweat. It allows one to completely unwind, relax and restore. It is ideal for people with chronic stress and muscle tension. 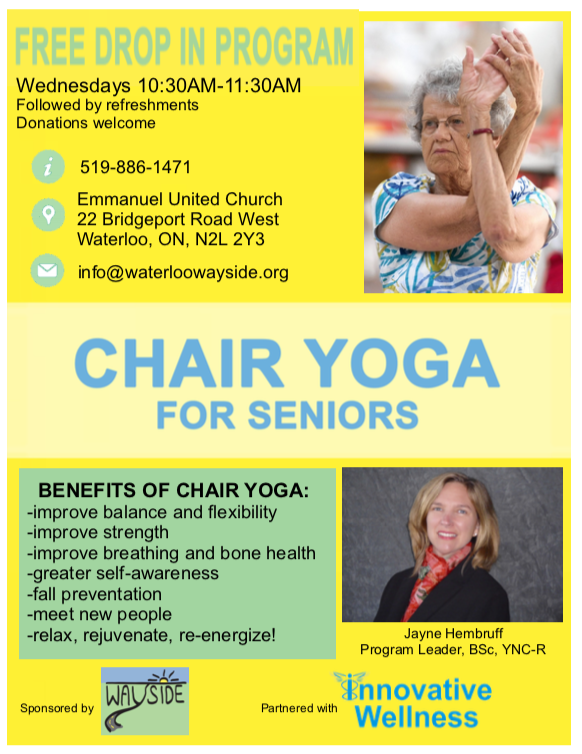 ?Jayne trained with both Judith Lasater, creator of Restorative Yoga and Cindy Lee. Learn effective tools and techniques to?care for your back. We begin each class in the unloading position to reduce pressure on the back, learn spine sparing strategies, and explore various BoneFit approved poses. Suitable for even the stiffest of bodies. Yoga Flow class is a more challenging class geared for those who already know the basic yoga poses and any required modifications. We take yoga poses and blend them into a beautiful flowing sequence. Pamper your body, mind and spirit?during pregnancy with gentle poses design to prepare you for labour, delivery and the arrival of your precious baby. Contact us to coordinate a good time for this class. Bond with your baby (Moms with multiples are welcome and encouraged to participate) and/or toddler. Post Natal yoga with your Baby is ideal for parents, grandparents and caregivers with babies and/or toddlers . This class focuses on providing physical relief from repetitive daily activities such as lifting, carrying and feeding, and aims to aid in recovery from pregnancy, childbirth, and stress. 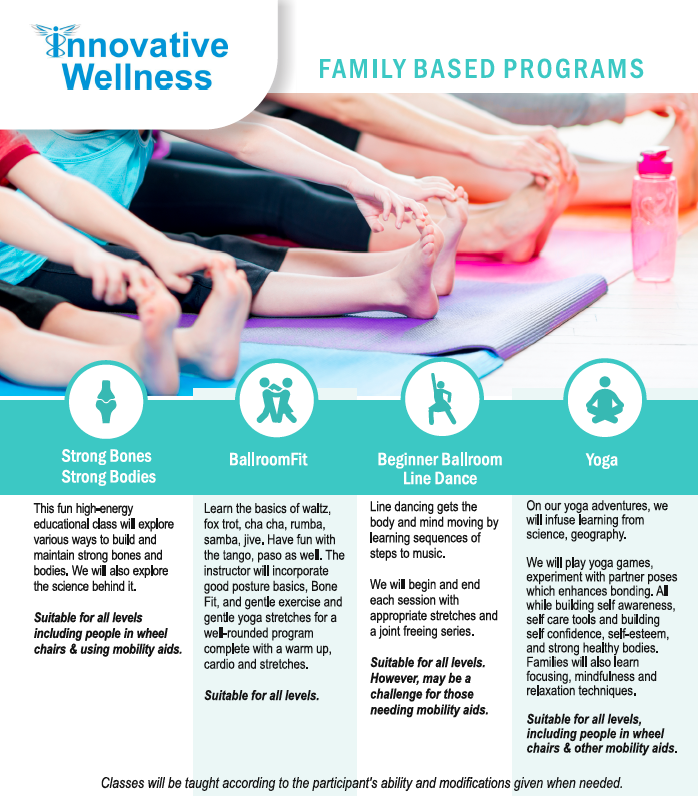 It is a great opportunity to connect with other parents and caregivers and learn how to integrate yoga into your new life. It is a great way to connect to your baby while you do yoga poses with your baby. You may also completely pamper yourself while your baby to sleeps or plays. Yoga is a great activity that you can do with your child no matter what age! Hop onto your magic yoga mat and let’s go on some yoga-tastic adventures! We may visit the ocean and transform into a whale, dolphin, sword fish, or sea turtle. Or we may stretching like a cat, be tall and strong like a mountain, balance like a blue heron, roar like a lion, cool off with the milk shake breathe, roll like a steam roller, flip upside down like a bat and be peaceful like sleeping beauty. All these poses help build self awareness and self confidence. While enjoying these adventures, we infuse learning from science and other disciplines with a focus on building self awareness, self care tools and self-esteem. Yoga promotes mindfulness, as well as strong healthy bodies and brains. This class promises fun for the whole family. No Partner Required. BallroomFit is a unique new gentle fitness class that blends the basics of waltz, foxtrot, quickstep, cha cha, rumba, samba and jive with BoneFit approved strengthening for the core. Suitable for all ages and abilities including people in walkers, and wheel chairs. 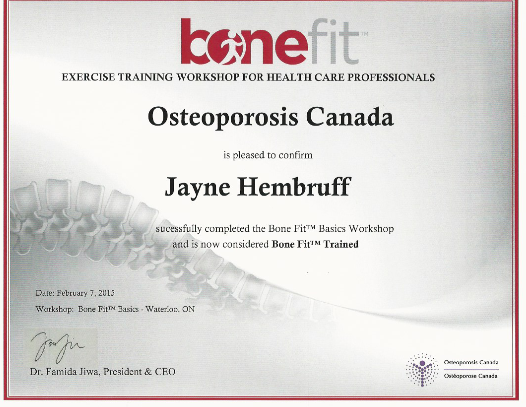 Classes are taught by Bone Fit Trained instructor and according to the participant’s ability and modifications given when needed. 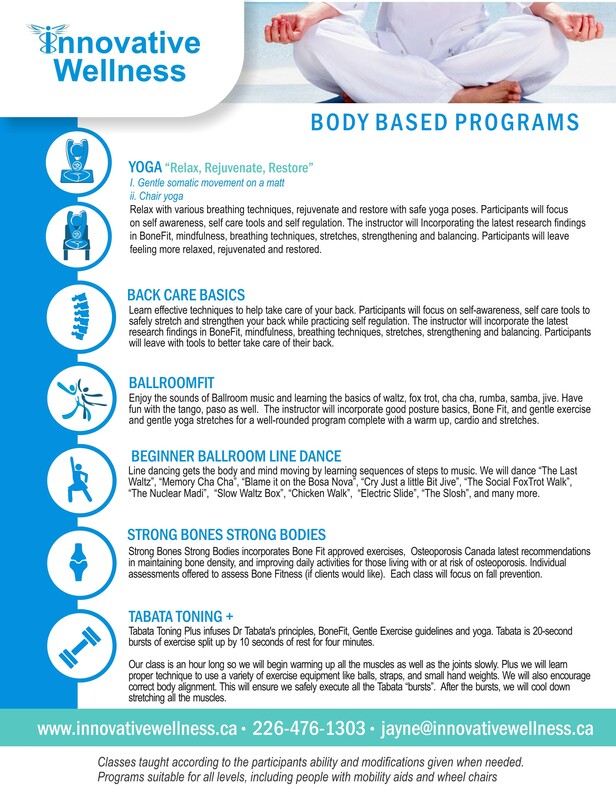 This fitness class is for all levels and each move incorporates Bone Fit approved exercises. Individual BoneFit assessments available. It?incorporate the latest recommendations for maintaining bone fitness, and improving daily activities for those living with or at risk of osteoporosis. Each class will focus on fall prevention. Enjoy the benefits of the Tabata method of moving for 20 seconds then taking a 10 second break. This is a great way to tone and improve your cardio. Jayne infuses gentle exercise, BoneFit techniques and gentle yoga. The focus is on working in a safe range to spare your spine, develop your core, strengthen in good alignment, have fun while increasing your cardio, as well as improving your balance, and ending with a great stretch. Contact us to book you your private class at your location or ours. “YOGA ON THE GO” – we bring yoga to you. Your home, your workplace, etc. To book please call 226-476-1303. Located conveniently near Weber and Columbia, near Waterloo North Police Station and Grain Harvest Bakery. Our cozy warm yoga den, is dimly light with candles. At the beginning of each class, fresh herbal tea is served. In the winter we make cinnamon apple, lemon ginger honey, very berry, mango cardamon or blueberry maple. In the summer we pick chocolate mint from our garden, or serve other local fresh fruit and herbs. This allows you to unwind before yoga. 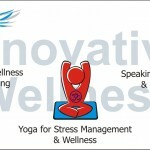 “Key Elements of Successful Health and Wellness Programs. Stage Three: Planning and Implementation“? This webinar will delve into the planning and implementation of health and wellness initiatives to ensure they are aligned with company objectives and generate desired results. We have identified 5 key elements for consideration as you map out the shape and objectives of your H&W program. 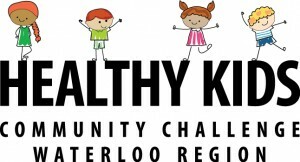 Participants will learn what steps are needed to plan health and wellness activities in their organization. 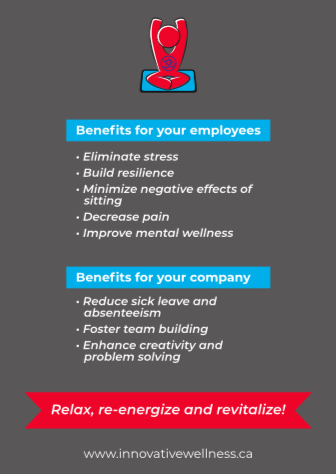 Through collaboration with internal staff and outside experts you can build the necessary programs and policies that help support employee health in areas that are important to them. 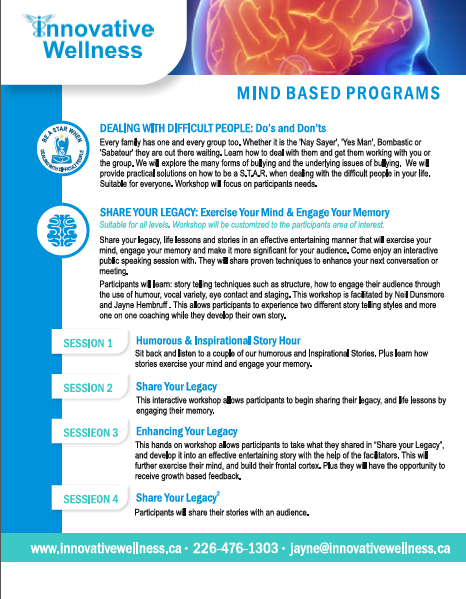 Programs customized to the needs of your workforce and based on the research, guidance and expertise required to maximize impact and ROI of your health and wellness efforts. This is a critical stage of your program development and will ultimately result in success or failure. ? 1-Executives interested in taking employee performance to the next level. Listen on line to?YOGA-TASTIC, ? 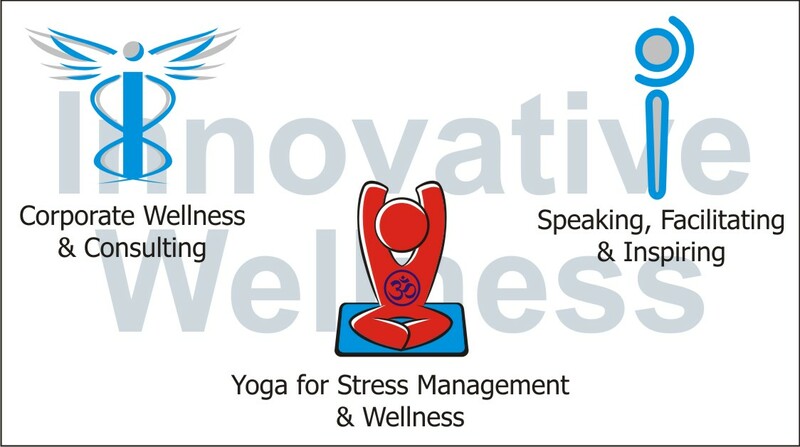 ?The Canadian Self-Regulation Initiative (CSRI) has just posted a?new webinar, ?Yoga as an effective tool to enhance a child’s ability to self-regulate? ?You may view the latest post at?http://www.self-regulation.ca/resources/webinars/?This webinar begins with an introduction by Dr. Stuart Shanker. 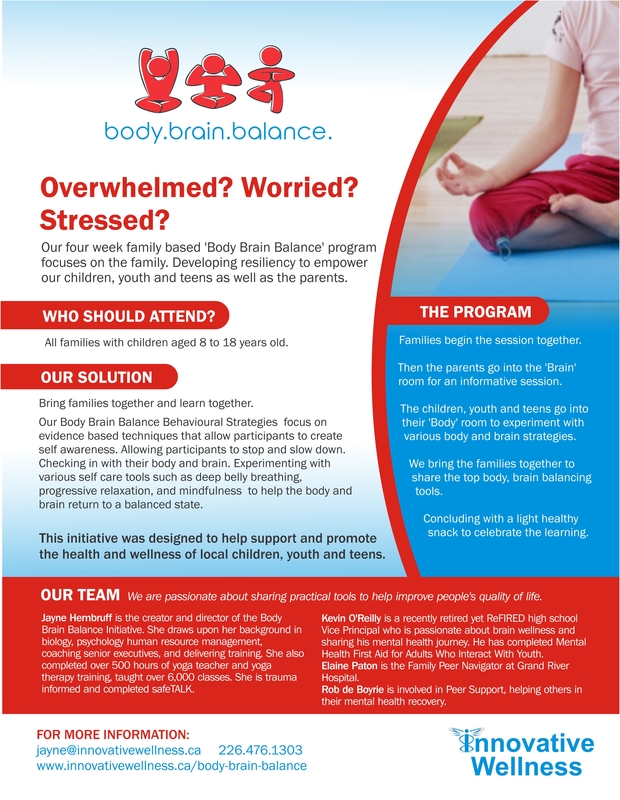 Followed by an overview of how yoga can assist children of all ages and abilities to STOP and listen to their bodies and minds, develop self awareness, and learn techniques on how to become more calm, alert and optimize their learning experiences inside and outside of school. 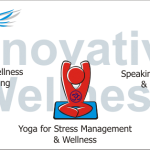 This presentation was designed and delivered by Jayne Hembruff, President of Innovative Wellness and ? ?expert on yoga for children? for the Canadian Self Regulation Initiative. We would like to invite educators, parents, grandparents and others working and interacting with children, youth and teens to watch this webinar. ?Our greatest hope is that you will go away from this webinar with a greater understanding and appreciation of how much yoga will do for children, youth and teens, as well as be motivated to enjoy the benefits of yoga for yourself too. 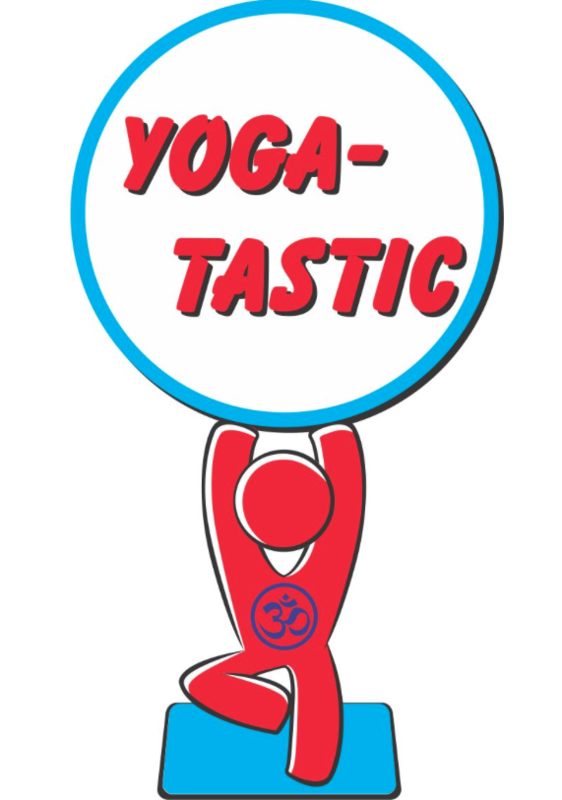 Our dream is to get YOGA-TASTIC into every classroom across Canada.